As if roasted cauliflower weren't good enough, I had to go and put a gremolata on top of the little white trees. You can make a salsa verde with capers and herbs, or a gremolata (which is basically lemon, parsley and garlic). Either or, the green sauce on the roasted vegetables is so good. Gremolata is also delicious on meat or chicken, especially on osso buco. You can use the leftover sauce the next day for your eggs or avocado, like I do! Remove cauliflower leaves and trim sides of the stem, leaving the stem for effect. Slice cauliflower into 1/4" thick slices. 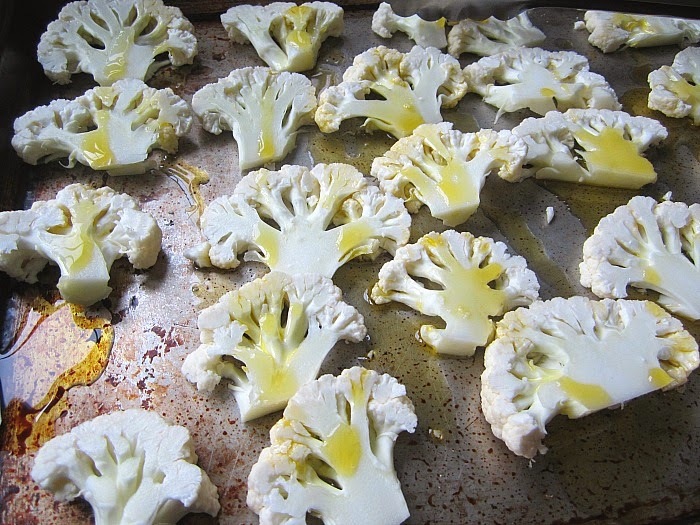 Arrange on a parchment lined baking sheet and brush both sides with olive oil and sprinkle generously with kosher salt. Roast for 25 minutes until golden brown. Chop the herbs fine and place in a bowl. Add in the rest of the ingredients, slowly drizzling the olive oil to create a nice dressing. 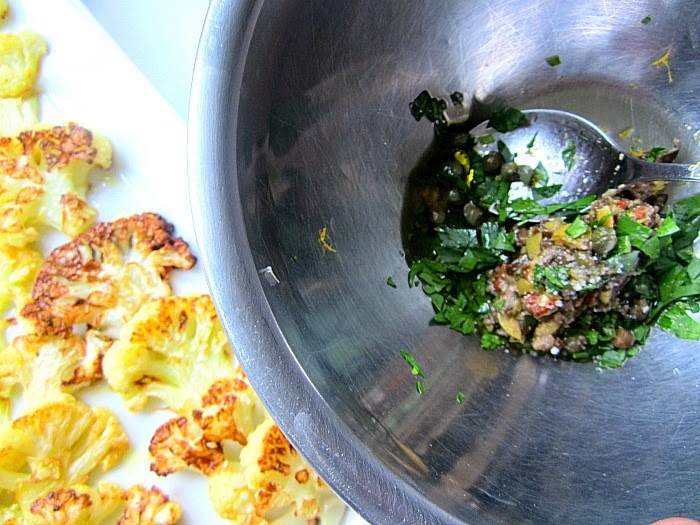 Gremolata traditionally does not have olive oil in it, but this version uses it so you can drizzle it over the cauliflower. Plate the roasted cauliflower and pour some green sauce over the vegetables. The next time I made this, I served it with salsa verde. Both are equally delicious. I'm assuming it's one head of cauliflower in this recipe? I never knew that making salsa verde was so easy (been buying it all these years). As a kid I didn't enjoy cauliflower much because mom made it plain with butter, but roasting it, and substituting it as a mash - are really great ideas! I do this too! 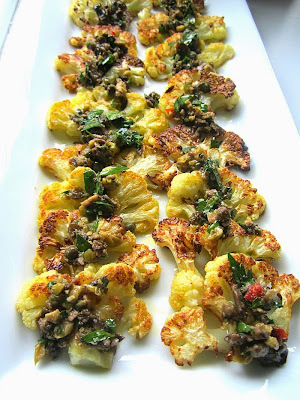 This is my favorite way to serve roasted cauliflower for Thanksgiving, because it's a little fancier. I also go a little untraditional and use red onion instead of garlic, I don't love raw garlic and I like the color the red onion gives the gremolata. I'm on a cauliflower kick lately. Can't get enough. Love the gremolata on the little trees! 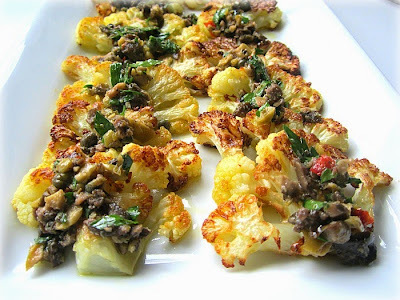 This is perfect for entertaining, a great side dish for the holidays. I had been thinking of making cauliflower with the lebanese version of gremolata for weeks! yum! What a perfect way to prepare cauliflower!